Home > Bimini Topp Marine Fabric Protectant 14 oz. Bimini Topp Marine Fabric Protectant 14 oz. Long lasting, durable UV protection for your boat’s bimini top and all outdoor fabrics. 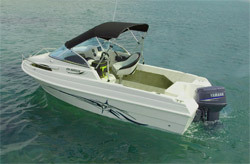 Your boat’s bimini top offers shelter and and shade from the elements. It provides protection by bearing the full brunt of the sun’s UV rays. 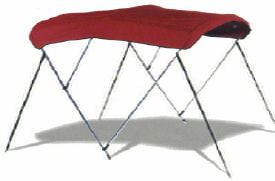 Bimini tops are also exposed to rain, saltwater, insects and bird droppings. Clean your bimini top on a regular basis and protect it with Bimini Topp Marine Fabric Protectant from Wolfstein’s Pro Series. Bimini Topp Marine Fabric Protectant is designed exclusively for outdoor fabric exposed to the elements. It penetrates and absorbs, forming a water-tight bond to outdoor fabrics such as bimini tops, fender covers, sailboat dodgers, sailboat spray hoods, sailboat covers and sail covers. Marine Fabric Protectant can also be used on outdoor fabric cushions, umbrellas and awnings. Wolfstein’s Bimini Topp Marine Fabric Protectant contains Ciba Tinuvin® UV Blockers that helps new bimini tops maintain their appearance longer. This strong protectant offers maximum protection against water, acid rain, oil, grease, salt, insects and bird droppings. Resilient water repellency renews after each washing, and Marine Fabric Protectant won’t wash off! This VOC compliant formula contains no silicone or petroleum solvents and will not damage or weaken fabric. This premium protectant extends the useful life of your bimini top and other outdoor fabrics. Bimini Topp Marine Fabric Protectant has been tested and endorsed by HAARTZ - the world’s leading manufacturer of engineered coated fabrics! Fabric must be thoroughly dry before applying Bimini Topp Marine Fabric Protectant. Clean fabric with Bimini Topp Premium Marine Cleaner first, before applying protectant. Hold can approximately 18-24 inches away from fabric surface to be treated and spray lightly using wide, sweeping motions. Two to three coats of Wolfstein’s Bimini Topp Marine Fabric Protectant are recommended for the first application, then reapply as needed.